In a new independent study of 17 security vendors, Qualys received top customer ratings in every category, and outperformed competitors in five areas: brand/reputation, value for money, delivery as promised, technical support and product reliability. 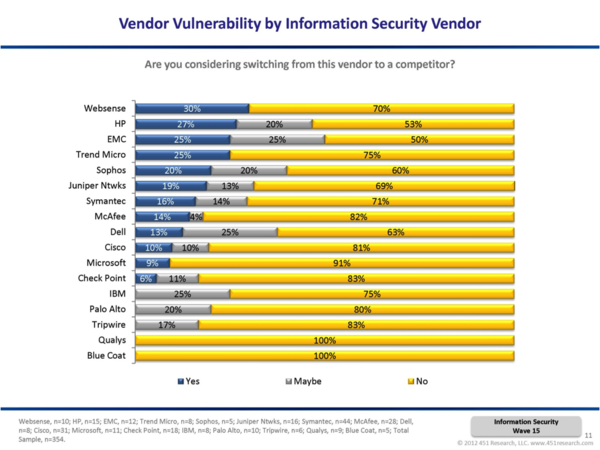 TheInfoPro Information Security Study examines key trends across the security industry as well as the performance of individual vendors. Conducted annually by analyst firm 451 Research, it is based on extensive live interviews with security professionals and decision makers at large and midsize enterprises in North America and Europe. We were one of only two vendors to receive positive scores across the board in the study’s Customer Assessment for Individual Vendors. In addition, Qualys was among only two vendors whose customers said they were not considering switching to a competing solution. According to Daniel Kennedy, research director for Networking and Information Security at 451 Research: "Qualys is a leader in vulnerability assessment and they are in a prime position to continue to grow market share with comprehensive cloud security services that help organizations respond to evolving threats. None of their customers were considering switching off their platform, with nearly 40 percent of respondents expected to increase their spending level in 2013." The results mean several things to Qualys. They not only show a vote of confidence for our business, but also underscore the inherent benefits of the cloud platform for security, which we pioneered in 1999. We are able to deliver a comprehensive suite of security and compliance solutions that are easy-to-use and deploy, at a fraction of the cost of traditional enterprise software. 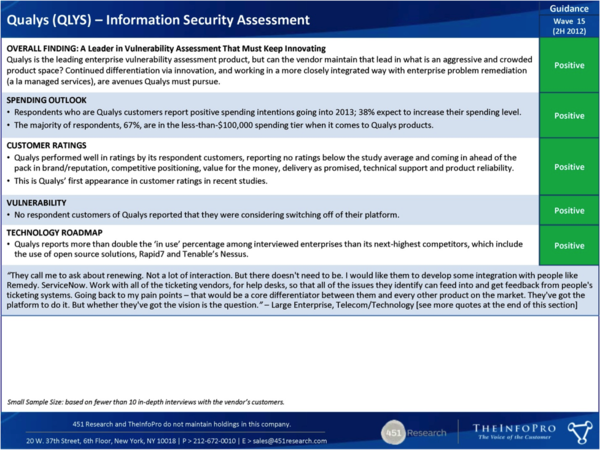 Read an excerpt from the "Customer Assessment for Individual Vendors" portion of the study and the Information Security Assessment on Qualys from the "Vendor Vulnerability and Spending" report.